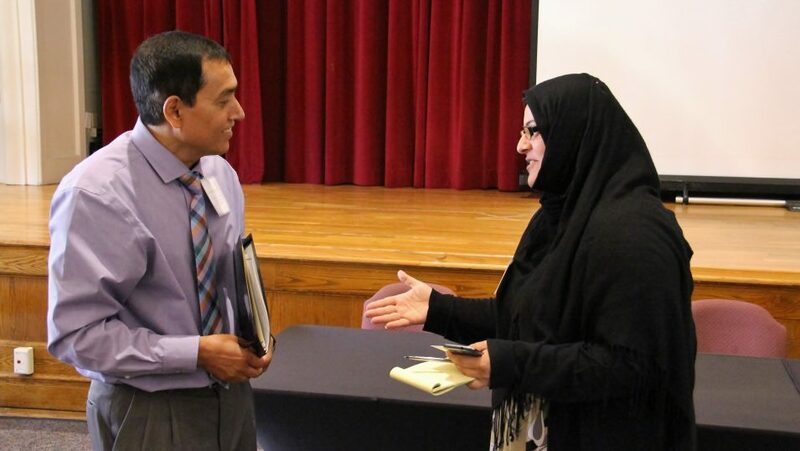 Chhabillal Timsina Sharma, left, a former refugee and now a psychiatrist who works with U.S. refugees, trades notes with a participant at EVER Changing World conference held recently at Saint Rose. He and his family are among the thousands of refugees each year who come to the United States to recover from emotional and physical trauma and perhaps thrive as new Americans. Sharma joined a host of experts from around the world who addressed the well-being of refugees and new immigrants at the EVER Changing World conference held earlier this month at Saint Rose. 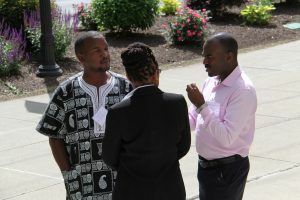 The fourth annual conference was sponsored by the Institute of Community Research and Training (ICRT), an interdisciplinary program at the College that addresses homelessness, mental illness and other social issues. Previously held in the Netherlands, the two-day conference looked at strategies that have helped migrants successfully transition to new lives. Mental health counselors, social workers, doctors, academics and community organizers shared their experiences, challenges and results. And the conference, which Saint Rose students and recent graduates also attended, culminated in a consensus to continue on, by advocating for much-needed services in New York and beyond. “The theme that emerged was ‘self-determination,’ that is we shouldn’t be telling people what to do but ask them how we can help them succeed,” said Richard Pulice, a Saint Rose social work professor and ICRT director. After arriving in the U.S. in 2003, Sharma worked at a photo copy shop, in fast food and at a gas station before finding his way back to the medical track and the training he needed to become a psychiatrist. Today, at the Health Partners Center for International Health in St. Paul, he uses a cross-cultural approach to his patients, non-native English speakers who have lost their homes and possessions along with their careers and social standing. He noted that many people showing signs of depression and PTSD – normal responses to horrific experiences – avoid treatment because in their home countries “mental health” problems equate to insanity or out of control behavior. To build a rapport, Sharma asks patients if they feel sad or tired, rather than using medical terminology. He then explains that there are doctors who can treat those symptoms – something people from less developed parts of the world might not be aware of. He also finds that newly arrived immigrants are so focused on their children and older parents that they don’t consider their own health. And Sharma urged counselors and other caregivers to respect their patients’ non-Western beliefs about illness and healing. 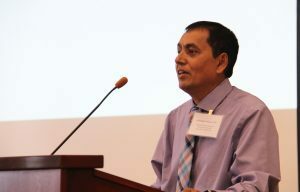 Sadly, Sharma has seen people who have survived torture and deprivation only to arrive in the U.S. and find that it does not live up to its reputation for instant prosperity. This was the reality in 2008, when persecuted and displaced people from his own native country, Bhutan, arrived in time for the worst recession in recent memory. The result: 58 committed suicide. The economy has since improved as people from that part of the world have established a foothold here. There are now more than 85,000 Bhutanese in the U.S. and the emerging community in his region has begun to thrive.